We teach young people, teens & adults —and we do it as good (and we think better) than anyone in town. We unleash human potential through lessons in our martial arts education of intelligent curriculum. On this website you’ll see just enough information to give you an idea of what we do —and the next step is to drop in or phone us, send us a note and feel free to ask us any questions we might not have yet answered. Your first month with us is free to try it out, while we see if you qualify for membership. We are a private school and we limit our enrollment. Find out more by clicking on "Info" in the Menu Bar or an image above. The step after that is to either come watch a class and/or make an appointment for our Free Month Introductory Course. Click Here for One Free Month to Try us out. Once you and your child have gone through our introductory program (like test-driving a car), you’ll know just about everything you need to know about us, including who is teaching, what’s being taught, and how much to budget for lessons. If you are Ready to Get Started, then to your Right Click the Ready to Get Started Link - Complete the questionnaire and we will contact you shortly. If you are not Ready to get started now - Parents (or anyone), stay informed with articles on safety & life lessons for children and adults. Simply subscribe to your right under "Don't Miss a Thing" by entering your email. We teach punching, kicking, blocking, wrestling, grappling & every aspect of the arts of self-defense that we ourselves have studied. It's good stuff & not only are we good at what we do, but every teacher of our team is working to improve his or her skills, daily. Speaking of who is teaching, Sensei Dan Rominski the Master Teacher & Owner of TheDOJO can be found teaching most every class assisted by instructors. What we do best is teach students, be it children, teens or adults how to overcome obstacles, set goals & work well with others. We offer a Free Introductory Course to any child, parent or individual interested in seeing exactly what we do. Okinawa Goju Ryu Karate, Shorin Ryu Karate, Judo, Jujutsu (Jiujitsu/JiuJutsu/Jiu-Jitsu), Kendo, Ryu Kyu Kobudo, Muso Shinden Ryu Iaido, Kung Fu, Daito Ryu Aiki Jujutsu, Aikido, and Reality Based Self Defense Training to name but a few. Please contact me to speak specifically about any style of martial arts you may be particularly interested in. 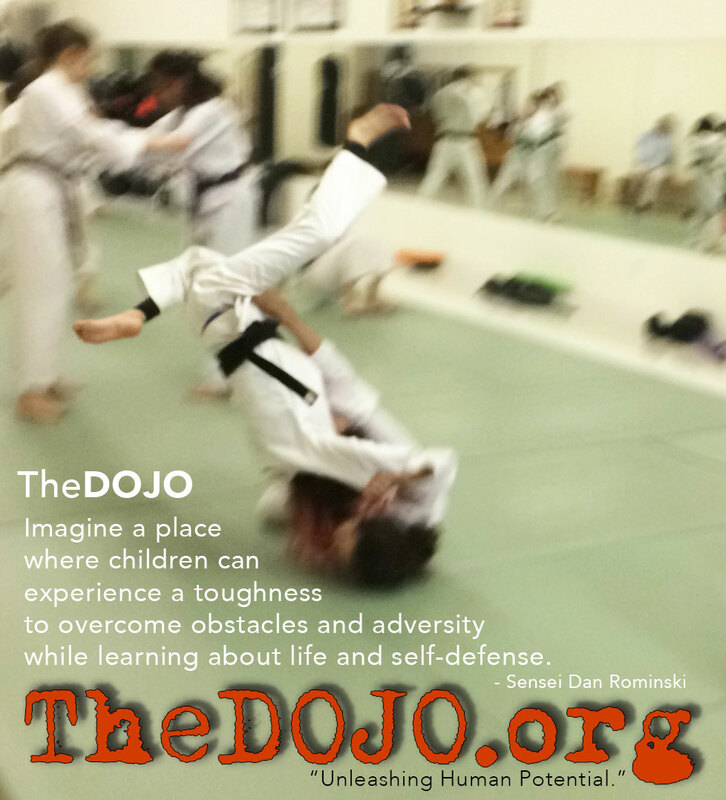 Why Every Child Should Learn Martial Arts at TheDOJO. Self-Defense Our martial arts education teaches practical proven self defense techniques that children get better & better at with practice. Children protect themselves with their knowledge. We give them the tools they need to protect themselves in any situation they may encounter. Focus & Concentration Our martial arts education teaches children the ability to focus. They learn HOW to learn while having fun & learning proper eye contact, how to concentrate ones mind & an attentive posture. We give them a safe outlet for all their energy. Confidence & Self-Esteem Our martial arts education teaches Children confidence & raises self-esteem. The key to building confidence is our belt ranking system. Martial arts is different from team sports because each time a child earns their new belt it raises their self-esteem. We have confidence building drills in every class that improves the way children really feel about themselves. Fitness Our martial arts education is a great way to get in shape. Students trim down while improving muscle tone & coordination. We teach healthy eating such as having more fruits & vegetables at meals & snacks, drinking water to stay well hydrated & the discipline to not overindulge in junk food. Why Women and Men Should Learn Martial Arts at TheDOJO. Fitness & Getting in Shape Our martial arts education gets you in shape while you work at your own individual pace. You never feel out of place because you are coached & motivated by the instructor & your classmates. With a coach in every class one to one instruction is always available. Stress Relief Our martial arts education is like a mini vacation twice a week. You recharge when your body & mind are doing something good for yourself, it actually makes us more productive. Self-Defense Our martial arts education teaches practical proven self defense techniques that you’ll get better & better at with practice. In our safe learning environment you’ll gain the tools you need to protect yourself in any situation you may encounter. Fun! Our martial arts education is very successful because we make it fun. When people are having fun they learn much faster. When you surround yourself with a positive peer group of like minded people doing on a journey to evolve you can expect to be inspired. All students are invited…This Saturday February 9, 2019 from 10 am to 11 am we are performing a martial arts demonstration for the senior citizens at The KIPP Center located in the parking garage right behind TheDOJO on Kipp Ave in Rutherford. Meet at TheDOJO by 9:30 am, we will rehearse and then walk across the parking lot to the KIPP Center for the event. Adult Students - The Saturday Adult Class will take place afterwards at 11 am to 12 pm. We will also be handing out Valentine’s Day Cards, which all the students this week will be making as a part of their karate classes. All students, siblings and parents are invited to this event on Saturday. Last year we did this and it was amazing! One senior citizen mentioned to me, “This will be the only Valentine’s Day card I get this year.” Think about it, some senior citizens have spouses and friends who have passed away. Aging can be lonely but not if you have 30 kids in karate uniforms hand you a Valentine’s Day card with their bright smiles and laughter. In a real village, people look out for one another through a strong sense of interdependence which is needed for everyone’s prosperity. These days it’s easy to get caught up in our “busy bubbles” (I know I can), this is a chance for us to commune with the senior citizens of our community. This project sets a stunning example for our children to show respect, kindness and love to our elders. In “parenting” we call this a teachable moment and teachable moments are always an opportunity for children to learn and experience life lessons which shape their character. Childhood is the training ground for later on adult behavior and as a parent I constantly think of what I am teaching our children today which shapes who they are in the future. I’d like to thank Vanvian Hoo and the Conway Family for spearheading this projecting for the second year! Thank you for your inspiring idea of connecting children with senior citizens to make a difference! At TheDOJO we Unleash Human Potential through our Martial Arts Education of Intelligent Curriculum. It takes a village to raise a child, we are honored to be a part of that village.